Harvard University, on the banks of the Charles River in Cambridge, Massachusetts, represents the pinnacle of higher education. It's often the school of choice for people from privileged families who make up the elite class of America. If you're already a member of the club, that's great. But the doorway to success hasn't always been open to everyone. That started to change in the fall of 1973, when the class of 1977 stepped on campus. Admitted alongside classmates like Microsoft pioneers Bill Gates and Steve Ballmer were the "Harvard 15" — fifteen high achieving Mexican-American students from low-income families. Luis Fraga is one of them. Raised in Corpus Christi, Texas, he believes his admission resulted from a decision made by the university "to admit small numbers of low-income students, first-generation-to-college students, and to see what that would be like." "I think the university saw it as a test of whether we could make it," Fraga told CBS News. Most of them did. Fraga rose to become a prominent figure in academia, now at Notre Dame and formerly at Stanford University, but the validation he may have been seeking from his alma mater didn't come until last fall when he was invited to speak alongside Ballmer at the Class of 1977's 40th reunion. He was the only one of the Harvard 15 to attend. "In coming back, I don't know anybody," he said. "I didn't know other groups of students who had similar experiences that I had. I came to learn that over time. But it was hard. There were tears." 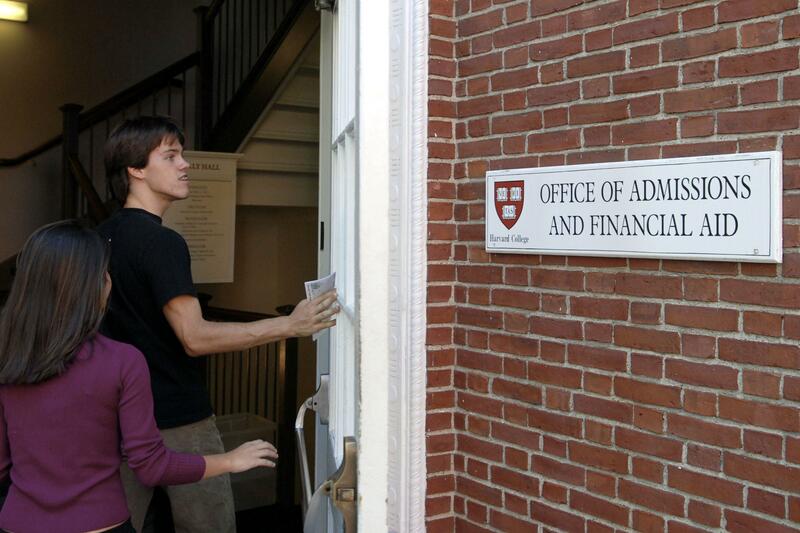 Harvard and elite schools like it remain a place for the privileged. At the nation's most competitive colleges, students from the richest quarter of the population outnumber the poorest quarter by 25 to 1. "Low-income and working-class students of all races are essentially shut out," says Richard Kahlenberg, an author and expert in education policy. "So we end up with a phenomenon where schools are bringing together largely wealthy kids of all colors." When that changes it will be because of students like Brandon Buell, a Harvard freshman who comes from a dairy farm near Madison, New York, and is president of the university's relatively new First-Generation Student Union (FGSU). "Diversity hasn't expanded to encapsulate low-income students. That's not in the modern rhetoric yet," he said. Buell, who will be only the third from among his 60 cousins to earn a bachelor's degree, believes his status is unique. "We don't have our families that have gone to college," he says, and that means they often don't know what is required to get in and stay in. Buell described his confusion in figuring out financial aid applications — "What's FAFSA?" — and dealing with other questions that more affluent families might find routine. The applied mathematics major credits an online forum filled with what he calls "helicopter parents" with providing the insight he needed just to get into the Ivy League. For Buell and students like him, access to a Harvard education can launch them from one socioeconomic class to another. A poor student has a nearly 60 percent chance to become a rich adult if they can get into an Ivy League school and graduate, which may be why groups like FGSU are springing up on the campuses of elite colleges all over America. Fraga and others from the Harvard 15 are prime examples. They met for a reunion of their own in California at the home of Rick Hernandez, who is now chairman of the board of McDonald's and a member of the Wells Fargo board of directors. They recounted similar experiences growing up and on campus. Hernandez recalled the feeling of being there "on your own, by yourself. Sink or swim." This is a familiar enough experience for college freshmen, but to first-generation students — young people with few if any reference points for navigating higher education — it can amplify the anxiety to the point that dysfunction sets in. Two of the Harvard 15, Hernandez notes, dropped out before graduating. Those who met the challenges and succeeded passed their legacy on to their own children. Their kids have also attended Harvard and other elite schools which, Fraga says ironically, is a principal reason these schools are enrolling fewer low-income high achievers. "More of our children are applying and getting in," he explained. The trek from racial to economic diversity is a hard one. The issue of diversity, whether related to race or socioeconomic background, still plagues American campuses. Those battles are being fought in court as well as in the hallowed halls of ivy. Most of the schools in the Ivy League have introduced generous financial aid packages over the last 15 years to assist low-income academic high achievers. At Harvard, any student admitted from a family that makes less than $65,000 per year essentially pays no tuition or room and board. Princeton University in New Jersey has adopted a similar policy, and coupled with new admissions practices, has seen considerable results. Twenty-eight percent of the current freshman class was low-income or first-generation. But for all the steps taken toward racial equality, there are still large strides to make for socioeconomic equality. Editor's note: A previous version of this story misstated that 2017 was the first year that Harvard had a majority non-white freshman class. 2017 was the second year admission was offered to a majority non-white freshman class.